When I think of a summer meal, burgers, watermelon, and corn on the cob come to mind. My family is picky about corn, refusing to buy it when it’s not fresh or in season. Lucky for us there’s a farm stand near our house. Mid-summer the stand seems to overflow with summer fruits and vegetables and we capitalize on the abundance of freshly picked ears. Back at home the ears are either boiled or grilled in their husks. Judged by the aroma coming from the pot of boiling water or the char-marks on the husks, as soon as they’re cooked my family grabs and consumes them. By my standard a good ear is one that’s sweet and whose kernels “pop” off the cob, no tacky-stickiness involved. Looking at the history of our modern-day corn, it’s interesting to see how drastically human selection has driven the evolution of corn. As the story goes, farmers ~6,000 years ago in Mesoamerica began driving the evolution of corn when they selected kernels to plant based on size and taste. Corn’s ancient ancestor is a grassy plant called teosinte. Through genetic analysis of allozyme (variant forms of an enzyme coded by different alleles at the same locus) 27 and 28 a single domestication of teosinte was determined. 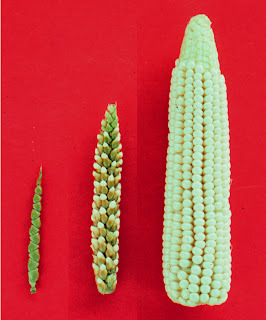 In comparison to the modern-day corn plant there are not many similarities. Today’s ears of corn average seven inches in length; teosinte’s length is about three inches. The ancestor’s kernels came equipped with a hard shell, while today’s corn has been selectively bred for a softer shell, which makes for easier consumption. Teosinte has kernels on two sides of the ear and they fall out at maturity. Corn has multiple rows of kernels, which remain on the cob. The differences from teosinte seen in corn are due to human selection. This dramatic change from an ancestral plant due to human selection is not unique in corn. This can been seen in many fruits and vegetables. An obvious example is the comparison of the small, tart wild blueberries found commonly in the northeast to the large, sweet ones in the plastic containers in the grocery store. These are known as lowbush and highbush blueberries. The highbush blueberries have been "improved" via artificial selection and are cultivated in unique varities. Lowbush blueberries are allowed to grow wild. Hufford, M. B., Bilinski, P., Pyhäjärvi, T., & Ross-Ibarra, J. (2012). Teosinte as a model system for population and ecological genomics. Trends in Genetics, 28(12), 605-615. Kalt, W., McDonald, J. E., Ricker, R. D., & Lu, X. (1999). Anthocyanin content and profile within and among blueberry species. Canadian Journal of Plant Science, 79(4), 617-623. It should also be pointed out that the industrialization of agriculture has led to research and development of new genes that will result in bigger fruits and resistance to pests and diseases. Today's artificial selection is therefore happens a lot faster than the past times.